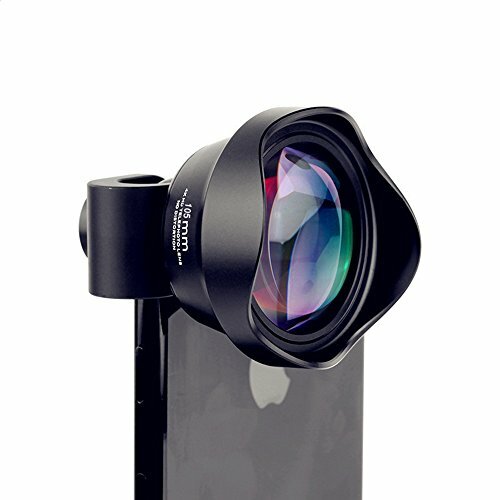 Capture all the tiny and wide scenry of whole world in your cell phone! Special attention should be paid to dust and dust prevention. Do not touch the glass lens with your fingers or other objects. Dust or foreign matter stuck on or inside the lens may affect the shooting effect. Remember to put on the protective cover after use, and fashion into the storage bag. It is naturally afraid of water like digital products. It is difficult to produce fog after entering the water, making the camera blurry and unusable. To prevent falling, the built-in lenses are made of highly translucent material, and falling onto hard objects is likely to be broken. Welcome to ask questions about product or sales policy, contact us in the Questions and Answers section. Our team will give you a better service. Any quality problems could be returned or refunded to us. [ Professional High Definition]Manufactured with superior grade glass optics and strong aluminum construction for enhanced durability, minimizes lens glare, reflection, ghosting and other artifacts. [5X HD Macro] Lensperfect shooting still life, plant, insect, jewelry, food, etc. Discover neglected beauty in your life. [Applicable Models] This phone accessories can be used with a wide range of cell phones and mobile devices including iPhone 7/7plus, 6, 6+, 5, 5C, 5S, 4; Samsung Galaxy S7,S7 Edge,S6 Edge,S6, S5, S4,Note 5 4 3 and so on. [The most profession photography lens accessories] For every perfect moment, enjoy class-leading performance and versatility for selfies, portraits, panoramas and vistas, large group photos, special occasions, concerts, road trips, hiking, vacations, architectural, cityscape, interior, and the most stunning landscape photography. If you have any questions about this product by Kangxinsheng, contact us by completing and submitting the form below. If you are looking for a specif part number, please include it with your message.